Product prices and availability are accurate as of 2019-04-25 18:50:37 UTC and are subject to change. Any price and availability information displayed on http://www.amazon.com/ at the time of purchase will apply to the purchase of this product. Chalkboard Wall Sticker as typesetting size (chalk not included) Note: Chalk is not included. Chalk used by children is recommended under the guidance of the guardian. How to stick chalkboard decal to the wall. 1. When receiving the blackboard sticker, please put it flat for 1 or 2 days. 2. Take the measurements of the place you want to stick, and cut compactable size to fit it. 3. Clean the wall leaving no dust and dirt before applying the stickers onto the wall. 4. 2 persons to apply the stickers are strongly recommended. 5. As you're applying the sticker, use a towel to wipe & squeeze bubbles underneath the stickers. 6. Please avoid direct sunlight, for sunlight will lead to bubbles underneath the stickers. 7. 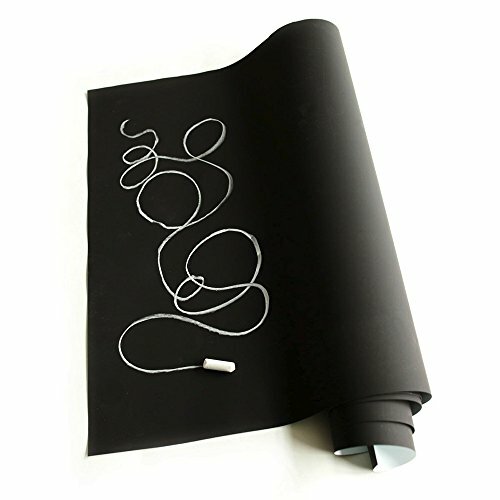 Chalkboard decal works with both chalk and chalk-ink markers. 8. The chalk on the board is best to be wiped off by a damp cleaning cloth, and please write when board is dry. Some wall paints are designed to resist stickers, please check before purchasing. And freshly painted walls are not recommended. The texture of the wall sticker is smooth (not like a rough surface like normal classroom blackboard!). Please avoid direct sunlight, for sunlight will lead to bubbles underneath the stickers. The chalk on the board is best to be wiped off by a damp cleaning cloth, and please write when board is dry.